A few weeks ago we had a guest who was wearing a stunning necklace–a Tree of Life. I asked her where she had bought it and she told me in Tsfat, but she didn’t remember the name of the store. And then, on Sunday morning, while walking around Tsfat’s Old City with my 18-year-old daughter, Hallel, a miracle took place. I was walking by a jewelry store and saw the same necklace I had fallen in love with! “No, just silver-plated. But it really is beautiful,” and Hallel agreed. So I looked at myself in the mirror, and I agreed too. My new tree of life had a soft glow like the moon on a misty night. 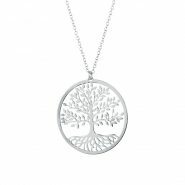 I would wear it next to my heart, my Tree of Life reminding me of the Holy Torah, deep roots nourished by primordial traditions, pulsing with life-force, invigorating my branch of my family tree. So I paid, gushing to the saleswoman about how blessed I felt that in all of Tsfat I had found exactly the necklace I had been looking for! What are the chances of that? Hallel and I continued along our way, and then I noticed something surprising… Another store that sold Tree of Life necklaces. And these ones were smaller, like I had been looking for. I agreed with her. Mine was more beautiful. But as we walked along, I noticed yet another store with Tree of Life necklaces. And then another and another and another. I must have passed at least 10 stores that sold Tree of Life necklaces, outnumbering the amount of felafel and Hebrew t-shirt stands–combined! The chain of my new necklace started to make my neck itchy. It was probably made out of something like fortified tinfoil which would be bent out of shape in no time. Way to go, Chana Jenny! You just flushed $30 down the toilet! And if I opened my eyes to him, I would see him? What does THAT mean? How do I open my eyes to him? If he’s not even HERE! But as I looked around, step by step, I noticed that subtly, slowly, the world around me started to look different. This ancient city, rebuilt after its Jewish community was decimated by disease, starvation, earthquakes, Arab massacres. Today crowded with Jews from all over the world. Ingathering of the exiles, pulsing with life before my very eyes! An African-American New York cop married to a woman born in the Soviet Union–today living in Tsfat raising Chassidic children. Hundreds of American Birthright participants, walking through the Holy Land, connecting deeply with their Jewish identity, many of them for the very first time. In a store window, I caught a glimpse of my reflection, with my new necklace. G-d’s gift to me that blessed morning. A Tree of Life.